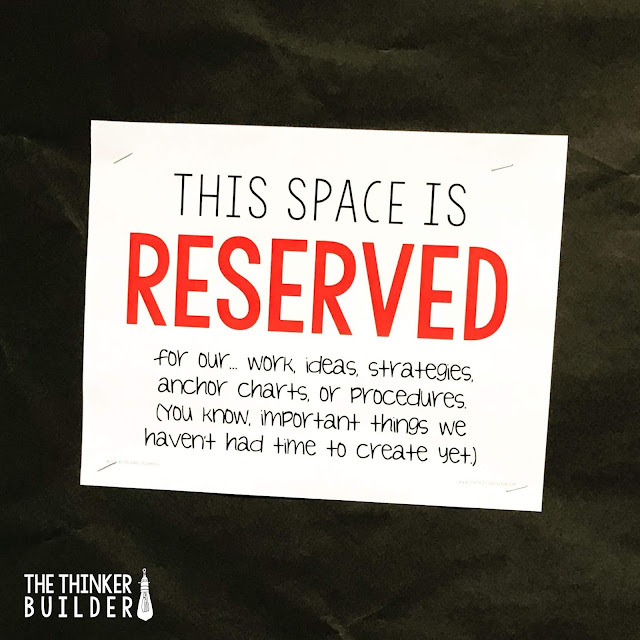 I'm going to let you in on one of my favorite classroom-decorating secrets. Whew. I'm finally finished covering these bulletin boards with this over-priced fadeless paper. Okay, so school starts in a week, and Meet-the-Teacher-Night is a week after that. And these walls look really... blank. I know that eventually I will add to the walls: anchor charts the students and I make together, procedures for Daily 5, and our best ideas and thinking and work that we produce. But I can't rush through that stuff just to get the walls covered. I guess I could hang up a bunch of these store-bought parts-of-speech posters left in the cabinet by the previous teacher, at which zero of my kids will ever look. At least the walls wouldn't look so bare. Hmm, what to do, what to do. So, at the intersection of the aversion to throwing things up on the wall just to fill the space and the urge to fill the walls with something, I created a "reserved" poster. The "reserved" poster is a simply-printed, single sheet of paper that I pinned to the empty bulletin board, showing students and visitors that the lack of "stuff" on the board was intentional. 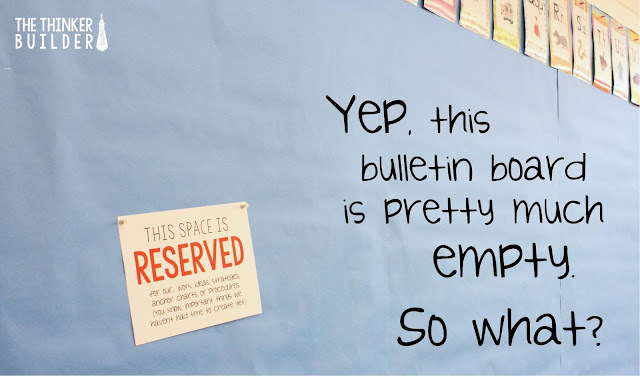 One thing true about the classrooms at my school is the enormous amount of bulletin board space. As a result, I'd start the year with three or four of these "reserved" signs pinned to the gaping spaces. To visitors, especially on Meet-the-Teacher Night, the signs are unexpected, they give a little taste of what's to come, and they add a bit of humor to the classroom decor situation. Parents no longer try to interpret the bare walls: "Why isn't anything on the walls? Did he not have enough time to get his classroom ready? Does he have time management issues? Has the class done nothing the first week of school? Or does he have an ultra-minimal design style?" Instead, visitors smile at the signs and return their focus to their child. 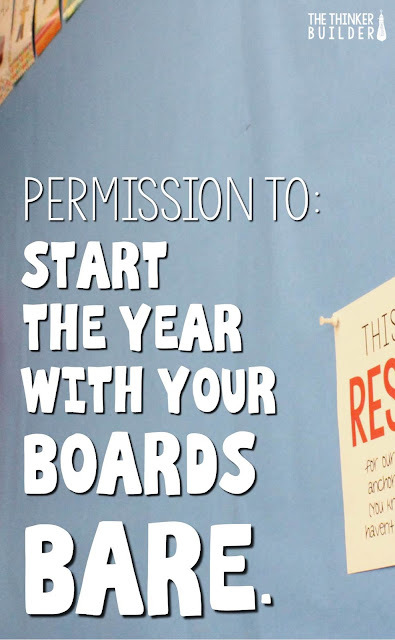 I officially give you permission to start the year with some of your bulletin boards bare. And maybe all of them! Click HERE to download my "reserved" signs. I made a couple of versions for you, including black-and-white. Hopefully they lessen your classroom-decorating stress level! 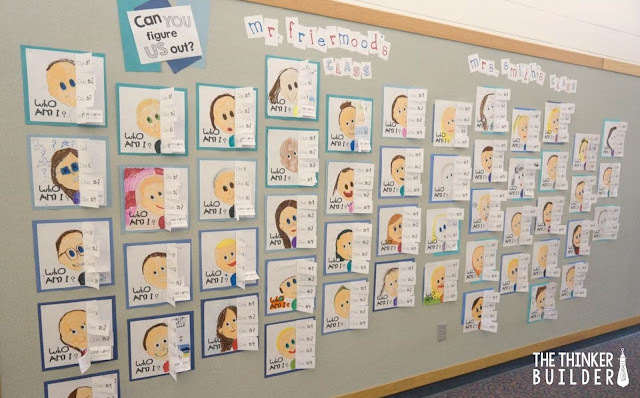 Now, if you want to fill one of those bulletin boards, maybe with something students create to show their parents during your Open House or Back-to-School Night or your Meet-the-Teacher shin-dig, you might want to consider my Who Am I? 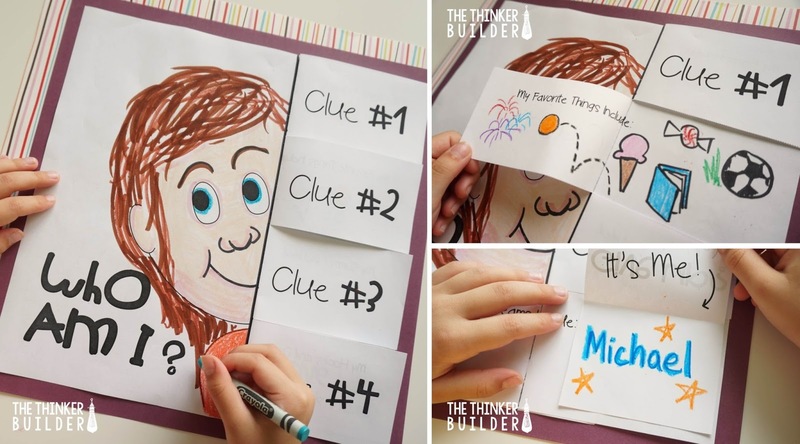 interactive posters. They make a fun back-to-school bulletin board! The Who Am I? poster activity is part of my Back-to-School "Get to Know You" Activities pack, with seven fun and fresh activities geared to grades 3-5. It also includes "A Map of My New Classroom" activity that I've used for a bulletin board, too! You can see more details in my TeachersPayTeachers store, right HERE. Whether your boards are bare or full, I hope you have a great beginning of the year!